PUP.WebPlayer is the term for WebPlayer, a website which streams French TV channels online. If you have installed PUP.WebPlayer, you have probably noticed that it adds a shortcut to the desktop so that you can access the website easily. 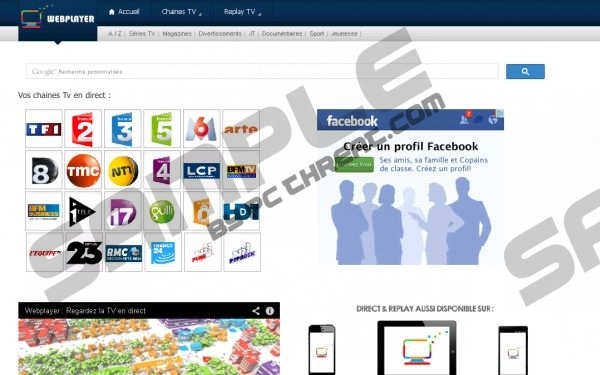 The channels available at webplayer.tv include TF1, M6, BFMTV, D17, France14, TMC and some other channels. WebPlayer also has a database in which different episodes of TV shows are stored. Moreover, it has a Google-based search that enables the user to find preferred TV channels and shows. However, it is important to mention that PUP.WebPlayer can be installed alongside some free programs, including browser add-ons and adware programs. For example, PUP.WebPlayer may arrive at your PC bundled with Pricora, published by Corporate Inc, and Bubble Dock, both of which can easily disturb you with various pop-ups. Pricora may display coupons and advertisements based on your search terms, whereas Bubble Dock may generate advertisements that are not related to your browsing interests. For example, it may generate ads that are usually found on the startup pages of browser hijackers. You may be invited to scan the computer online, install a system optimization tool or get involved in some other activity. If you want to protect your information stored on the PC and prevent annoying advertisements, you should remove those unwanted programs from the system as soon as you can. If you do not want to remove PUP.WebPlayer from the computer because you want to watch TV online, then avoid clicking on the advertisements that are displayed on the page. They are not necessarily malicious, but by avoiding suspicious advertisements you minimize the risk of computer infections and adverse consequences that may follow. A single click on a link which leads to an unknown website may execute a malicious computer infection, so if you want to avoid computer threats, make sure that the system is protected. If you do not known how to uninstall PUP.WebPlayer, follow the instructions below. They will help you uninstall the unwanted programs. If you have accidentally installed a browser add-on which displays coupons, advertisements and price comparison information, do not hesitate to scan the computer with a reliable scanner in order to make sure that all the cookies and other components related to that program are deleted. Uninstall WebPlayer and other unwanted programs. Select Add or Remove Programs and uninstall the unwanted application. Select Uninstall a program and remove the unwanted applications. Quick & tested solution for PUP.WebPlayer removal.